Chemical weapons use in Syria is Barrack Obama’s trap – the trap he laid for himself ever since he laid down their use as a red line which, if crossed, would oblige the United States to act. However, chemical weapons may also be his way out of the trap. We may not know for months – possibly years…possibly never! – who was responsible for the dreadful gas attack in the Ghouta suburbs of Damascus last Wednesday (21st). The Syrian Government alleges that rebels used chemical weapons armaments stolen from military depots to try to stop the Syrian Army’s advance in Ghouta. Al-Arabiya, amongst others, has covered the Syrian TV networks’ reporting of the Army finding rebel tunnels in Ghouta stocked full of chemical weapon cannisters, gas masks, and other equipment for waging and surviving chemical warfare. Thus, the Syrian Government blames the rebels for the civilian deaths in Ghouta. A dark extension of this theory is the notion that the rebels deliberately used chemical weapons on civilians to create the appearance of a ruthless and deadly attack by Government forces. Their motivation, in this theory, is that the resultant atrocity is so appalling it creates such an irresistible tide of public and media demand for action in the West that Western governments are obliged to conduct some form of intervention on the rebels’ side. Dragan Lokki Veljkovic, in his comment on Bloom’s Facebook posting, notes that, in part at least, NATO was sucked into being the Albanian rebels’ airforce during the final (1999) phase of the Kosovo conflict, by Yugoslav Army and Serb paramilitary atrocities against Kosovo Albanian civilians. Veljkovic writes: “The KLA [Kosovo Liberation Army] was conscious that they couldn’t win without Western intervention and that the killing of large numbers of Albanian civilians by Yugoslav forces was a necessary condition for that intervention. Then the humanitarian excuse for intervention would become credible.” Veljkovic quotes one Dugi Gorani, a Kosovo Albanian politician, as saying: “The more civilians were killed the chances of intervention became bigger and the KLA of course realised that. There was this foreign diplomat who once told me: unless you pass the quota of 5,000 deaths you’ll never have anybody permanently present in Kosovo from the foreign diplomacy.” In light of such comments, it has been alleged that a number of the atrocities supposedly carried out by the Army and Serb paramilitaries were either fabricated or, in fact, carried out against their fellow Kosovan Albanians by the KLA to manipulate public and media opinions in the West. As to the Americans’ assertion that ‘common sense’ tells them the rebels do not have the resources to carry out such a wide-ranging and devastating chemical attack…as Bloom points out elsewhere on his Facebook timeline, many of the rebel groups are bankrolled by Saudi Arabia which could easily have funded the resources for such an attack. So, as yet, the assertion that the rebels carried out the chemical weapons attack at Ghouta cannot be ruled out. As yet, what happened at Ghouta seems vague and murky, despite the plethora of horrific videos posted on YouTube and similar video-hosting sites. 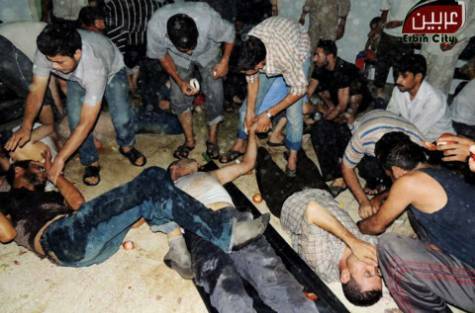 American Secretary of State John Kerry and British Foreign Secretary William Hague have stated their unequivocal conviction that the attack was carried out by regime forces. However, Russian Foreign Minister Sergei Lavrov continues to point out that the West has yet to produce evidence to back up this view. Unless, the Americans have evidence from a reliable source no one else has yet considered, it does indeed seem premature to draw conclusions when the United Nations inspection team has barely been able to start its investigation due to ongoing fighting in the Ghouta area and there have been previous credible allegations of use of chemical weapons by rebel forces (Shaun Waterman, 2013). Not only is there confusion as to what happened and who did it but even estimates of the number of fatalities vary widely. According to Bassem Mroue & Albert Aji, the Syrian Observatory of Human Rights had reduced its initial claim of more than 1,300 killed to 322. Médecins Sans Frontières reported approximately 3,600 victims with ‘neurotoxic symptoms’ in less than 3 hours on the morning of the 21st; of these 355 died. By Sunday 25th the Violations Document Centre had counted 457 deaths. If the rebels were behind the Ghouta massacre, then they must be more than a little pleased with the American warships now massing in the Mediterranean and talk of cruise missile strikes against key Syrian military targets. That’s quite a hike from 3 months ago when Obama showed little interest in Syria and the French and British put at least a 2-month hold on selling any lethal arms to the Syrian rebels. So has Cameron bounced Obama into a more vigorous, sabre-rattling response in the same way that Margaret Thatcher reputedly got George Bush to respond to Sadam Hussein’s invasion of Kuwait in 1991 and Tony Blair hectored Bill Clinton into ‘doing something’ about Kosovo…? In which case it’s worth asking why? What’s in it for Cameron? Certainly, like Blair, he seems to have an itchy trigger finger for military campaigns – especially if they have a humanitarian sheen to them. Thus, the GREEN vMEME finds an excuse for RED to enjoy getting glory through victory while also indulging the destructive urges Sigmund Freud (1923b) called ‘Thanatos’. Being a war leader getting the Americans to ‘do the right thing’ (thus, fulfilling BLUE’s needs) enables the British prime minister to be ‘great’ – even if his country isn’t anymore – on the back of the United States’ military might. And let’s never forget Thatcher’s Falklands War comeback from being the most unpopular prime minister in modern British history, a comeback which gave her the public support she needed to take on take on the miners a couple of years later. A ‘good little war’ almost always increases the leader’s standing amongst their own people. If he is to be remembered as anyone other than the man who failed, Kerry needs a big hit. Blowing the hell out of key Syrian military installations and thus creating a level battlefield between Assad’s forces and the rebels could be considered the kind of ‘big hit’ Kerry needs – possibly big enough even to put him back in the running for another crack at the presidency when Obama goes. They are undoubtedly biased but the Russians (supporters of Assad and munitions suppliers to his forces) and the Chinese (traditionally anti-Western meddling in the affairs of other countries) agree strongly with al-Zoubi. An attack on Syria could be catastrophic, they say. The new, relatively-moderate leadership in Iran, ever so tentatively edging its way towards admitting a desire for rapprochement with the West, is already firmly back in the anti-American camp, joining with the Russians and the Chinese in warning of ‘dire consequences’. Quite whether Russia would go to war for Syria – as some World War III theorists have speculated – must be highly doubtful. But neither is Russia ready to back down quietly when its one remaining ‘friend’ in the Arab world is threatened by the ‘old enemy’. Post-strike, Russia would almost certainly harden its stance towards the US, leading to a new ‘cold war’ and seeking to undermine American interests where there was the slightest intimation of a difference between them – including arming those who opposed American interests. Another argument as to the cause and motivation for Ghouta is that Assad and his generals have come to the conclusion that the West is so confused and divided over what to do about Syria that a kind of collective inertia has overtaken them. That inertia Assad believes, according to commentators such as Ron Ben-Yisghai, will lead to there being no effective response to pretty much whatever the Syrian Government forces do. I’ve wondered whether the West’s appearing weak and divided might lead to Assad taking more extreme measures to defeat the rebels more quickly. Assad and/or some of his advisers and generals seem to show the cruelty, ruthlessness, impulsiveness and compulsiveness of being high in the temperamental dimension of Psychoticism. Thus, gassing the residents of Ghouta to send messages throughout Syria and beyond of utter ruthless and determination to win that would terrify many out of sympathy with the rebels and their cause, would be a perfectly acceptable thing to do. On a cognitive level, if the West failed to react to even this provocation, then the message that there is absolutely no hope of serious Western help would also be sent to the rebels and their commanders. In which case, why go on? If the Syrian Government did take this gamble on Western weakness, then Assad and his generals, as they view the warships in the Mediterranean and the war talk in the Western media, must wonder if they’ve played the wrong cards. Doubtless, they will take some comfort from the polls published in the Western media. Leslie Wroughton reports that, according to a fresh Reuters/Ipsos poll conducted 19-23 August, only 25% of Americans would support an American strike on Syria in the wake of a chemical attack while 46% opposed it. Tim Ross cites “wide public opposition to British involvement in ‘any kind’ of military action in Syria” from a YouGov survey of 2,000 participants. If a rebel faction did carry out the attack at Ghouta, such polls must be devastatingly bad news, indicating the horrific pictures and videos are actually having an opposite effect on public opinion to that desired. One danger in Assad seeing the West as weak is that Obama ‘toughens up’ Wild West macho style to avoid being shamed. No leader wanting to stay in power can afford to be seen as weak when challenged by another country. Thus, Obama’s RED vMEME is vulnerable to the enthusiastic war talk from Kerry, Cameron, etc. Obama has had to put up with the likes of Republican Senator John McCain calling for overt American intervention in Syria more or less since violent repression of the initial protests escalated them into an armed uprising. He’s used to that and can portray McCain’s criticisms as the kind of posturing and manoeuvring he would expect from a political opponent. Shrugging off ‘man up’ talk from allies like Kerry and Cameron is that much harder. Even if the public appear not to support a strike on Syria, Obama is under immense political pressure, now from both right and left, to take action. If Obama’s drivers are considerably situational, Cameron’s appear more dispositional. Not only are the British public apparently opposed to action against Syria but so are many in his own government and his own party. Deputy prime minister Nick Clegg is talking Cameron’s talk but many in the Lib Dems, led by Sir Menzies Campbell, are clearly doubtful of the case for an act of war. Douglas Carswell, John Baron, Andrew Bridgen and Sarah Wollaston are just some of the high-profile Tory MPs demanding Parliament has a vote on whether to go to war or not – yet Cameron shows no sign of taking any other viewpoint on board as he talks loudly of the preparations for a strike. Under different kinds of pressure, Kerry, Cameron and their supporters seem to be trapping the once notoriously-reluctant Obama into a form of what Irving Janis (1972) called a groupthink, a tightly-knit group in which they isolate themselves from those who don’t think like they do and thus cut down the input on which to base decisions. Janis coined the term from studying how the Kennedy White House got itself into the ‘Bay of Pigs Fiasco’ in 1962. Tony Blair was part of George W Bush’s groupthink that blundered into Iraq in 2003. If the groupthink can be weakened, then the key players may be more open to consider other options. I posit that a major common interest the United States and Russia share in the Syrian conflict is fear of chemical weapons falling into the hands of extreme Islamists who might then go on to use those weapons against American and Russian targets. So should there be a joint Russo-American invasion of Syria to seize the chemical weapon stocks? To do so with any hope of success would require a massive operation – General Martin Dempsey, US Chairman of the Joint Chiefs of Staff, reckons hundreds of aircraft, ships, submarines, thousands of special operations troops and at least 20,000 ground forces (Jonathan Marcus, 2013a). A joint task force with the Russians – with clearly-defined areas of responsibility – could close the civil war down temporarily and enable the chemical weapons to be taken into United Nations safekeeping. Since Russia is increasingly a wealthy nation, it would also enable some sharing of the eye-watering costs of such an operation. For months the Russians have been dragging their heels on their part in bringing about a peace conference. (Not that the Americans and the Europeans actually had much of a coherent opposition to bring to the table!) The reason for Russian prevarication has been clear: their client, Assad, has been winning. A US-UK task force in and around the Mediterranean – more than likely joined by French aircraft too – changes things. All of a sudden Assad could be in real trouble. Forget the potential long-term consequences of a Russo-American war fought out by proxy across the entire Middle East. In the short term, if there’s a rain of cruise missiles on his military installations, Assad goes overnight from being reasonably sure of eventual victory to having a flattened and demoralised military without much of their heavy weaponry. Given the incredible determination of the rebels – and, in particular, the fighting prowess of the jihadists – there’s a very real possibility Assad’s regime would fall. Following a brief second civil war, in which the jihadists would finish off the moderate Syrian Free Army, the most likely mid-term outcome would be a radical Islamic caliphate centred on Damascus. That is something neither the Americans nor the Russians want. So now the West may be finally committing to some kind of action over Syria, the Russians do have a real motive to work together with the United States and her European allies. The best-best outcome would be a joint invasion followed by a UN protectorate. The worst-best outcome would be some kind of consultation/agreement between the Russians and the Americans on ‘surgical strikes’ to take out as many as possible of the chemical weapons stocks of both sides…but leaving the civil war ongoing and without changing the balance of power too much. The worst-worst outcome would be a rain of cruise missiles that changes the balance of power in Syria, facilitates the establishment of a radical Islamic caliphate and sets the United States and Russia off on a new cold war across the Middle East, with frequent proxy ‘hot’ eruptions and Russia and Iran forced together as unnatural allies against the common enemy of the United States. What needs to be done – what is the best solution, taking into account all needs and wishes (as far as reasonably possible)? Who is best able to do it? What will motivate others to contribute to the solution? What will be the longer-term effects on the ‘Bigger Picture’? The descent of the Syrian conflict into evermore hellish carnage is deeply unsettling. Yet out of it, if only social heroes could grasp opportunities – are you listening Barrack Obama, David Cameron, Vladimir Putin, etc? – could come wonderful possibilities for new models of resolving major internal conflict. Before his selfplex was hijacked by George W Bush and Iraq, Tony Blair was grasping for such a new model when he talked about the way so many countries had worked together to intervene to positive effect in Kosovo and had given at least tacit acceptance to the 2001 American invasion of Afghanistan. Blair never did quite crystallise what he was questing for and the possibilities those few years created were squandered in Iraq. But now, as the West teeters on the brink of yet another crisis intervention, maybe – just maybe – there is a chance to do something different and improve the way human societies deal with violent conflicts. 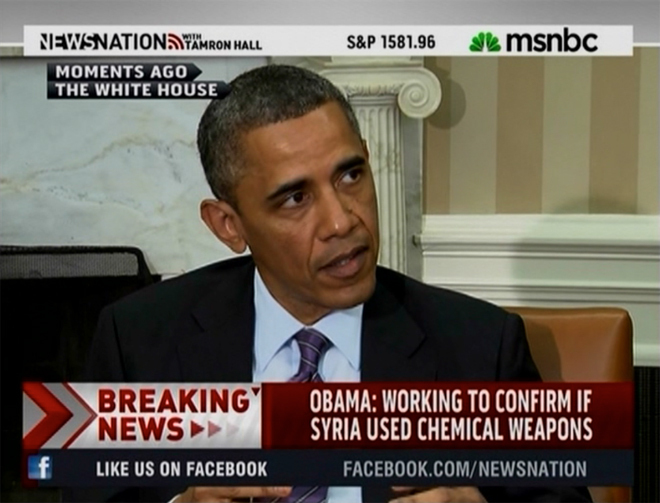 If, indeed, it was Assad who used chemical weapons, he is, of course, absolutely right. But there needs to be compelling evidence that it was Assad. And, if it was the rebels who were responsible for Ghouta, they may use them again too. Either way, the Ghouta massacre and Obama’s red line statement have brought the Syrian crisis to a point where the world can no longer either look the other way or sell their favoured side munitions. It is time for the US and Russia to take joint oversight of Syria. I doubt Obama’s quality of thinking is up to that and I’m convinced Kerry’s, Cameron’s and Putin’s aren’t. So the real danger comes from the poor quality of leadership amongst the main players. Looks like Ed Milliband may finally be showing quality leadership. His insistence on ‘compelling evidence’ that it was Assad’s forces which used chemical weapons at Ghouta be produced before Labour will support the Government launching a strike…is a master stroke. At once he’s supporting the principle of punishing the use of chemical weapons while inhibiting Cameron from supporting Kerry & Obama’s desire to strike Assad ahead of evidence. Since the UN inspectors are there to establish the fact of a chemical attack, not whodunit – there could be some time before there is ‘compelling evidence’ of either Assad’s forces being responsible – or the rebels. Of course, Kerry (& Obama) may go ahead without Britain. But no UN resolution, Britain on the sidelines and Russia, China and Iran all protesting furiously could make the US look really bad. Especially if there are high civilian casualties. Especially if that ‘compelling evidence’ can’t be produced. Hopefully Kerry’s BLUE is strong enough to prevent his RED/ORANGE ambition leaving him so exposed. Fantastic news that Labour have forced the Coalition to agree to a second Commons vote before launching the cruises – that vote taking place after the UN weapons inspectors report. British delay almost certainly means American delay – and it almost certainly means Obama & Kerry (or should that be Kerry & Obama?) will have to publish their evidence (supposedly!) unequivocally laying the blame for Ghouta at Assad’s door before launch. Personally, I wouldn’t be surprised if Assad did it and I wouldn’t be surprised if the rebels did it…but a rain of missiles on the Syrian military is unlikely to produce any result other than further disaster. What the delay does provide is a much-needed breathing space which could allow the Americans and Russians to look at how to work together at how to contain Syria – perhaps in the way I have speculated on in this blog. Perhaps all the sabre-rattling by the Americans and the British will turn out to have been a game to get the Russians to invest in a peace process. Interesting that one Russian web page I briefly landed on today compared the current crisis to 1962’s Cuban Missile Crisis…that was a ‘game’, albeit one which had the potential outcome of pretty much annihilating the human race. So fantastic news that there’s a delay. But it may turn out to be only a delay. We desperately need 2nd Tier thinking from our leaders. Or at least for the money men – the 1% – who control most of them to whip the silly buggers into line! Michael Synder’s 22 Reasons Why Starting World War 3 In The Middle East Is A Really Bad Idea – http://theeconomiccollapseblog.com/archives/22-reasons-why-starting-world-war-3-in-the-middle-east-is-a-really-bad-idea – is another blog which makes some more critical points as to why the Americans and the British should slow down their rush to war. Snyder’s view of the Syrian rebels is almost certainly over-simplistic but that only knocks out 2 of his 22 reasons. The rest look good to me! Gary Stamper at his Collapsing Consciousness blog has covered some similar points in Looks Like War with Syria is Imminent: An Overview of the Danger We’re In – http://www.collapsingintoconsciousness.com/looks-like-war-with-syria-is-imminent-an-overview-the-danger-were-in/. He also draws attention to the short-term profiteering that can be done through American intervention in Syria and highlights some web articles which further highlight just how ill-informed the Obama-Kerry-Cameron strike policy is at this stage. As Kerry seems to be leading the charge to fire off the cruise missiles, I wonder if it could be worth someone investigating Kerry’s corporate connections to explore just what he’s going to get out of this. ‘Moral obscenity’ be damned! At least 2-3 times the average estimate fatality rate of Ghouta will be achieved if those cruises get fired. And that’s just for starters!